Contents Forum Merchandising Guestbook Our Sponsor: Toast Back to What's new Buy the books! Trying to write a Chronology about Thursday Next is fraught with difficulties and I am upgrading constantly as I receive new information. The following is the 'best guess' I can manage at the current date. (January-February-March?) 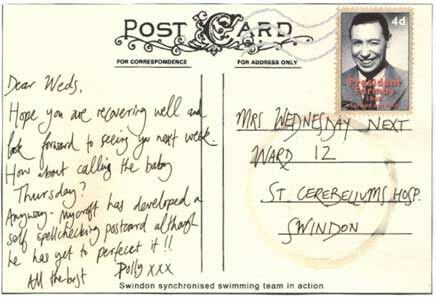 Born at St Cerebellum's Hospital, Swindon. 1951 Starts school at St Zvlkx's school for infants. 1956-1964 Educated at the Blessed Lady of the Lobster school for girls, Swindon. 1966-1969 attended Swindon University, studied English literature. 1971 Joined Wessex County police. 1972 Commendation for bravery in police manoeuvre involving Kidnapping of Goliath Corporations's CEO's daughter, Ethel. 1972 (November) joined the Regular Army during Crimean Peninsular emergency. 1973 (August.) Fought with Wessex Light Armoured Brigade during infamous charge of Russian Artillery. Survived charge and returned to England. Refused to accept the 'Crimean Star' for services rendered. Brother Anton killed. 1974 Returned to Swindon and rejoined Wessex County Police. 1975 the official report of the charge is published. It blames ANTON D. NEXT, Thursday's dead brother. Colonel Frobisher gave evidence against Thursday's brother. 1975 Leaves Swindon for London. Joins Metro Police. 1975-1976 (?) Metro police serious robbery squad. 1977 (?) Promoted to Detective Sergeant and Inducted into SpecOps-27, The Literary Detective division of the Special Operations Network. 1981 Distinguished bravery award - reason classified. 1985 Worked on theft of original Manuscript of Martin Chuzzlewit from Gad's Hill, Kent. 1985 (June) Hospitalised for gunshot wounds, cause unknown but may be related to quadruple murder in London. Styx Hades, brother of Acheron, shot dead, Mrs Grimswold found wedged up chimney and two SpecOps officials, also shot, later named as Filbert Snood and Fillip Tamworth. All other details classified. 1985 (July) Takes post in SO-27 office in Swindon. 1985 (August) Jane Eyre vanishes or is kidnapped from book. Thursday returns Jane Eyre to book, methodology unknown. Acheron Hades deleted from 'Most Wanted List' What happened to him, no-one knows. Repeated requests for information from SpecOps illicit no new information. 1985 (September) Marries Landen Parke-Laine (author) at the Blessed Lady of the Lobsters, Swindon. Thursday's World Tour engineered by SpecOps PR guru, Cordelia Flakk. Trouble in New Zealand but otherwise unremarkable. 1985 (October) Appears on 'The Adrian Lush Show' and gives little information away. Possible SpecOps and Goliath influence, although hotly denied by both parties. Inventor Uncle Mycroft retires, wherabouts unknown. Leaves MycroTech Developments in hands of two idiot sons, Wilbur and Orville. Thursday is arrested and apparently questioned about assault on neanderthal Skyrail operator who was later shot dead by SpecOps marksman. Hispano-Suiza automobile falls from airship; narrowly misses Thursday when out walking on the Uffington white horse with husband Landen. Thursday travels to Osaka on Gravitube. Reason unknown. Thursday is driven to the opening of the Booktastic sales by woman dressed in 'dirty wedding veil' - identity unknown. Thursday charged with 'permissioning her horse and cart to be used by a person of low moral turpitude' by Swindon Police. Volescamper announces gift of Cardenio to Yorrick Kaine and the nation. Thursday photographed at Les Arts Moderne de Swindon show at Wanborough, organised by brother Joffy. According to SpecOps records, Thursday does one night's work on SEB containment with agent 'Spike' Stoker, SO-17. Thursday faces discplinary board over neanderthal assault. Findings unknown. Toast Marketing Board announced as official sponsors of SpecOps-27 Swindon. Power grid failure at Mycrotech section of Constuff Plant - reason unknown. Guests of Cordelia Flakk actually meet Thursday at her apartment. Please come forward whoever you are and tell us what happened. Thursday vanishes, quite suddenly. Landen Parke-Laine at a loss to explain her disapperance. Vague hints arise about a sister of Acheron Hades but nothing clear. Memories tend to be hazy on this subject and files and papers mysteriously displaced and forgotten about. 1985 (November) 27 Litre Liberty-engined Higham Special spotted doing illegal time trials on A409. Witnesses describe Thursday being present along with a woman who matches the description of the person seen driving Thursday to Booktastic in September. Accidental release of medical records suggests Thursday may be pregnant. Father unknown. 1986 (March) Accidental declassification of SO-1 document links Thursday Next to Acheron Hades, third most wanted man on the planet until 1985 when he vanishes (Coincidence?) (To see declassified document and explanation,click HERE HERE). 1986 (April) Thursday officially dismissed by SpecOps over absenteeism. Chance discovery of one of Thursday Next's laundry lists which confirms signature and gives a small glimpse into her life. (For pictures and analysis, click HERE). 1987 (July) Mycroft and Polly reappear quite suddenly, giving no clue as to where they have been hiding. 1988 (July) This happened only two weeks ago, so I have very little information. Thursday reappears with no explanation as to where she has been hiding. I am still trying to piece this together. Early reports suggest she has a son, aged approximately two years. 1988 (Yesterday) Surprise result at SuperHoop '88 croquet final between the Reading Whackers and the Swindon Mallets throws England into chaos. This website does not support Babbage analog computing engines, Flipettygibbit© Tachyon modem streaming or DampString© transfer systems. For optimum viewing use Quang-17 Biotech vitreoceramic file module recovery systems with the Bolton and Watt accelerator plug-in.